Nearly 35 years after Mao Zedong's death and 20 years after the end of the Cold War, deep-rooted Maoist insurgencies persist throughout Asia as well as in Latin America. In Nepal, a brutal people's war has given way to a false peace, where violence has become a political tool. In India, Naxalite guerillas have managed to sustain a bloody insurgency by exploiting the failures of the state. And in Peru, the Shining Path has survived predictions of its demise through an intense focus on discipline and organization. For Nepal's largely impoverished population of 25 million, which lives in a territory the size of Florida, a bloody decade of people's war has since 2006 given way to "peace." Yet to call the situation in Nepal peace is appropriate only if one believes that Lebanon with Hezbollah and Gaza with Hamas are also at peace. In reality, war continues using other means. In July 1967 an uprising of tea-plantation workers led by Maoist militants in Naxalbari was brutally suppressed. Naxalbari seemed likely to become little more than a footnote in India's history of rural revolts. 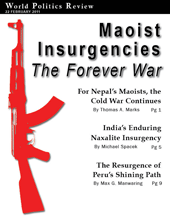 But more than 40 years later, the Naxalite rebels are still waging an deadly insurgency. Stretching from the foothills of the Himalayas to the country's southern tip, the area has come to be known as the "Red Corridor." Peru's economy has grown faster than any of the other bigger countries in Latin America, yet there is great dissatisfaction with the government. Less than 30 percent of Peruvians are happy with the way their democracy works. It is not surprising, then, that despite pronouncements of its demise, the Sendero Luminoso, or Shining Path, insurgency has not only enjoyed a resurgence, but continues to evolve.